No time skips this week, phew. But Concrete is barreling into it’s second cour with gusto. Join Kikko and Gugsy as we examine the penultimate episode of the season. We left off last week with Claude revealing his identity to Kikko’s shock and surprise, as she turned into her Devil Queen form. It turns out the fruit/medicine/ginger root thing that she ate to unleash her true form was given to her by this new Doctor Jin towards the tail end of the 42nd year. When we return to the 43rd year immediately following the aftermath of the Claude incidents, we arrive at Hokkaido with the Bureau and the Sciencers/Strange Power Risk Management Office. What they find is something truly horrifying: a lab dedicated to experimenting on superhumans, hearkening back to the Nuremburg code and the unethical experimentation of human subjects in our world. Claude was trying to unveil this tragedy to the world and to force the hand of the government. This brings strife and turmoil to the Bureau as Kikko believes that Claude’s actions are much more just than the nefarious actions of the government. This leads to her eventual departure from the Bureau, and disappointed with Jiro, her unrequited love. Jiro, on the revelation of Jin’s identity, returns home to find the Doctor conversing with the Teito Inc. Boss about Jin and the Daitetsu Maki incident. The Bureau, though, isn’t as clean as we initially thought, as they have played a significant part in these experiments. The Doctor says he studied superhumans in the Ikuta Labs, the same labs that we saw Jiro in in his youth (34th of Shinka Era, Episodes 5&8). And we have also seen from the MegaGon incident that both he and Emi are still taking covert samples of Jiro to study, probably without his knowledge (42nd of Shinka Era, Episode 5). In the next scene, we find the Inc. Boss now meeting with Jin, probably playing both sides against each other for his personal gain. Jin plans to meet with Golubaya Laika, but Master Ultima intervenes and shoots down Laika. 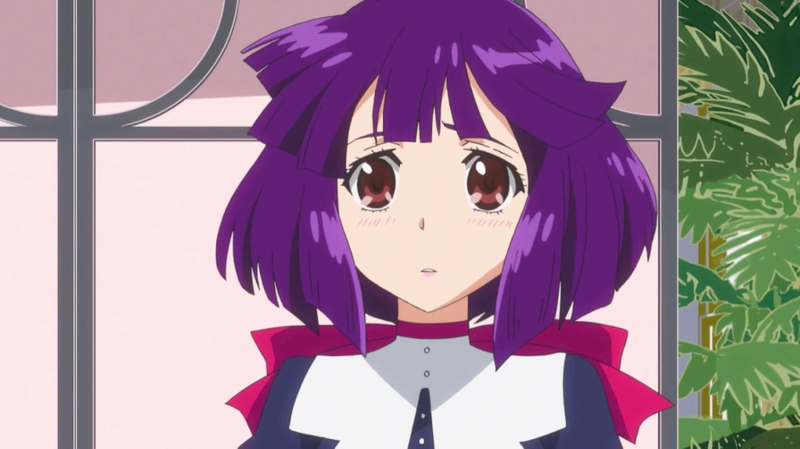 Kikko continues to confuse Jiro with Claude, as she continues to hope that Jiro would put the mask on to protect his identity and protect superhumans, like he did with the Rainbow Knight incident (Episode 8). Unfortunately, it’s increasingly clear that those medicine root things she’s taking are clouding her judgement. The ideals, the goals and the beliefs that she wishes Jiro had regarding superhumans, she finds in Claude. That superhumans deserve to have their rights protected, to not be used by the government as tools and weapons, to be allowed to live in peace. The tensions between the students and the government that has been festering all season are starting to break out into conflict, as many of the young superhumans among the youth are coming around to Claude’s beliefs as well. Master Ultima arrives, driving Claude, Kikko and co. away, and takes Golubaya Laika away, under the pretense of him breaking the law. We find in the ensuing scene between Claude and Jiro that the kidnapped kids from the Rainbow Knight incident were actually taken away to Ogasawara Island to be experimented on further. And even more shocking, the Doctor/ Jiro’s father knew about the whole thing, and instead labelled Rainbow Knight as a villain, in order to create the Bureau! Chief Akita was an alien from outer space, in control of the Bureau. Given the other two aliens he conversed with in prior episodes, there’s no way of knowing how far they have infiltrated in the government so far. They are specifically called Fumers and are trying to find other beings that can evolve into similar Fumers. Or in this case Superhumans that can evolve. Its clear that the situation with Claude and Jiro is going to devolve into hostilities in the final episode. An easy prediction to make is that some part of this situation will drive Jiro away from the Bureau, possibly involving Kikko. The situation with the Doctor and Jiro is very interesting, but I don’t think it will play a huge role for now. Instead, I foresee the revelation that the Doctor and Emi have continued experimenting on him to be the straw that creates Scarf Jiro, but we may need to wait for that in the second cour. Anyway, we’ve got one last episode before the Spring season! August-November, 41st of Shinka Era: Beasts begin attacking and many Superhumans appear to defeat them. (Episode 4). And that’s where we are at so far in Concrete Revolutio! Let me know if I’ve made a mistake somewhere! Thank you Federico for the Images!